Red Pepper Quilts: Sunday Stash #67 and a Giveaway! Sunday Stash #67 and a Giveaway! "I would like to send you some fabrics. Because i like them and because i love your quilts. I don't want you to buy them from me. I don't want you to write about me or make any kind of publicity." And without further ado these gorgeous fabric arrived in my letter box during the week all the way from Romania. I don't know anything about these fabrics except that they are a beautiful cotton fabric, and that they are bold and colorful. As promised to Diana, one kind deed deserves another, and as such today I am giving away the pictured bundle of the much coveted Flea Market Fancy fabric from my stash. The draw will take place at 10 am (AEST ) on Tuesday 7 September 2010, at which time comments to this post will be closed. The winner will be contacted by email. ENTRY HAS NOW CLOSED AND A WINNER HAS BEEN DRAWN. The fabrics from Romania are stunning! Do you think there is any way that the first commenter on this giveaway could win Rita? Those are beautiful! How fun to have fabric from that far away. Wow both lots of fabric are stunning! Lucky you! Those are beautiful fabrics you received...and the Flea Market Fancy are beautiful too! Having never owned any of those great fabrics, I'd love to win a little! Love the orange flowers! I also really like the fabrics from Romania. hmmm...sounds like this could be the beginning of a quilty pay-it-forward! Very pretty fabrics - I'd love to own them!!! Those are beautiful fabrics. What a compliment! That is so very kind of Diana and also of you! I love the fabric she sent you and the Flea Market Fancy! Awwww ... how nice to pass on the generousness (is that word?) of a such a giving person. I love all the fabrics! Isn't it great how blogging can join together people from all over the world?! How sweet of Diana, I love her fabrics! And so sweet of you too to pay-it-forward again. Love FMF! That is so sweet of her! I love what she sent. And of course, the fabrics you're giving away. Beautiful! They are so beautiful!! I love them all ready! Ooh lovely! It's a fabric cycle, fabrics in fabrics out. Love your gift and what you are giving. . . fingers crossed! Oooh! Both sets of fabrics are lovely and full of possibility. Thanks for your kind deed in sharing! What a nice gesture! Maybe the lady from Romania will see her fabrics in something you make and blog about one day. What a wonderful giveaway - to celebrate a gift:) I would do the same if I win these yummy Denise Schmydt fabrics - though what compares to the Flea Market Fancy?? How thoughtful of Diana, and how thoughtful of you! How nice of her to send those to you! And what a lovely giveaway from you! Oh lala, I just love this line of fabric! What a couple kind thoughtful girls you and Diana are! Thank you for the giveaway! Can't wait to see what you do with those Romanian fabrics! Whooo look at those fabrics! I really like the blue and green one that she sent you. That grey fabric makes me giddy! What a wonderfully sweet thing to do! And it will be fun to se what you do with it. Thank you for doing a give away in return! Quilters are some of the nicest people I know. I would love to win some FMF but I also just want to say how encouraging it is that people like Diana are out there. No fuss just trying to do nice things and encourage the "community" I'm glad you shared this story because it's important to know that nice people are still out there. Now that's just nice!! Thanks for the give away! How gorgeous. I have no doubt that you will make excellent use of these special fabrics all the way from Romania :-). you are so generous to pay it forward!!! the fabrics she sent you are beautiful. i love all the vibrant colors. So generous of Diana and so generous of you! Hopefully whoever wins will do the same and pass on some of their favorites! Enjoy the rest of your Sunday! Beautiful fabrics! Diana has a website? I am from Romania and I want to know her. That is so nice! I would love to win them, they are beautiful! So nice of Diana and you too! All of the fabrics are fantastic! I totally like when people do nice things because it just makes you want to do something nice for someone else!!! Aw, that is such a lovely gift and it is so nice that you are passing the gift onto another! I would definitely love to win me some FMF...you even have a couple of prints there that I'm missing from my very limited stash! Love the fabrics, thanks for the chance. Thank you so much for the lovely story and ensuing giveaway! Love those fabrics you were sent! And the one you're giving away are pretty fabulous, too. what an amazing act of kindness! I LOVE, LOVE, LOVE flea market fancy, never managed to get my hands on any of it so I'm keeping all my fingers crossed! Thanks for the chance to win this. Love the fabrics! I haven't used any of the modern fabrics but I'd love to have you get me started. quilters are such generous people! 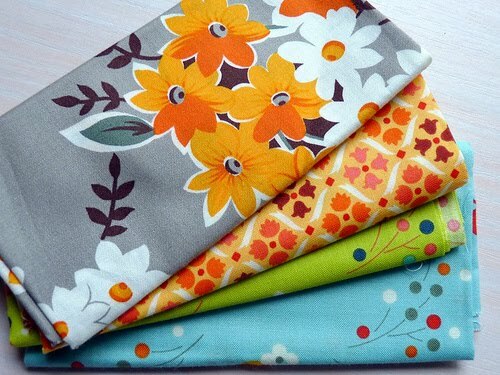 What gorgeous fabrics you received...and what a generous giveaway you're having! Please enter me...I came late to the Flea Market Fancy party and have had a hard time collecting some! so sweet! thanks for the giveaway! OH Boy! My heart thumped when I saw those fabrics. Beautiful. How sweet of Diana! I am in love with all the fabrics pictured. Thanks for the generous giveaway. Really nice of her to sent them! I love the idea of "paying it forward" with fabric! What a great giveaway! Thank you for the chance to win! How fun! I would love to make something gorgeous from those fabrics, and then continue the kindness chain! I love those fabrics-- both the ones you received and the ones you are giving away. Thanks for sharing with us! I love the gray and orange. What a generous giveaway! I love this fabric and would LOVE some to use to make something for my daughter. What an awesome giveaway! What sweet fabrics she gave you! and a very cool way to pass on the kindness! Thank you! yes! Those are awesome fabrics. What a great story. I love this quilting/fabric community. So willing to share. Like Diana, I too love your work and your blog. So very inspirational. Thanks for the give-away chance! Two beautiful bundles of fabric. Can't wait to see what you make. Thanks for the giveaway. Those Romanian fabrics are gorgeous! And what a great way to pay it forward! Thanks for the giveaway! you are one lucky lady!! hopefully i will be too!! what a generous act from Diana -- and such beautiful fabric! Thanks for all the wonderful inspiration your blog and quilts create. Isn't that nice? Both sets of fabrics are just lovely! Enjoy playing with your new fabric! Why doesn't anyone ever email me offering such lovely fabrics? And such lovely fabrics too. Not fair! Random acts of kindness are the best ones! It's very kind from Diana, and you are very generous as well. A fabulous blog to read and a FMF give away!!?? Too much! What a nice thing for Diana to do. Wonderful people attract other wonderful people! thank you for paying it forward! your romanian fabrics suit you nicely! Lovely fabrics! Can't wait to see what you do with them. How sweet! What a great way to pay it forward! I love the Romanian fabrics! So bright. Hope you have a fantastic weekend! How very cool to get such lovely fabrics from another country! enjoy! Lovely fabrics, seeped in good karma! Aw, I love the gestures. I promise to 'pay it forward'! Wow!...isn't those gorgeous stash from Romania!!! Obviously she is your faraway admirer of your lovely work. Enjoy! That is so so sweet! I would love to be in the giveaway, and if I win I'll definitely pass the deed along on my blog. I love your four fat eighths! Grey and orange are my favorite colors. Please count me in. What a lovely PIF. That's awesome! My husband and I have been to Romania several times on mission trips. Looking forward to what you create with these fabrics. Lovely fabrics from Romania and the FFF is always awesome. Stay dry in your crazy Vic weather. What a nice surprise. Perhaps I will be surprised too! That e-mail is so sweet, and also strangely poetic--it kind of reminds me of William Carlos William's "This is Just to Say" (http://www.poets.org/viewmedia.php/prmMID/15535). Quilters really are so nice! Thanks for the giveaway! Oh, I really, really, REALLY would love to win JUST one giveaway ! If I win this one, I'll quit entering ! and tell me that these treasures are MINE ! By the way, thank you for your generous heart, even if they DO go to someone else......and THANKS, DIANA ! Oh those fabrics are gorgeous!!! Lovely message, lovely fabrics! I'd love to win the Flea Market Fancy- it's my favorite (me and the rest of the world, I guess!). What a generous give away, thank-you for sharing your beautiful quilts and fabric! Those fabrics are fun! I'm sure you'll make something great from them. I especially like the brown/orange/pink polka dot-ish looking one. I'm so late to the boat on the whole Flea Market Fancy thing, but the more I see them on different blogs, the more I like them. What a wonderful surprise for you! And a fabulous giveaway for us! It's the small things that make a day! Those fabrics from Diana are beautiful. Thank you for paying it forward. How kind of Diana to send such lovely fabrics! And how kind of you to pay it forward! oh the joy of the Random Act of Kindness. Cute fabric. Diana sounds like a very nice lady! Lovely fabrics! Thanks for the giveaway! The world really is full of the most beautiful and generous people. Thanks for the chance to have some of these beautiful fabrics. I love the big orange flowers! And those Romanian fabrics are gorgeous--clearly I love big stylized flowers. How kind of you and Diana! Lovely fabrics. Oh my goodness what lovely fabrics, I would la la LOVE to win! What terrific FMF fabric, a sweet giveaway and a sweet surprise gesture from Diane in Romania. What a sweet thing for Diana to do! And what a sweet thing for you to do, too! I love those fabrics, but have never owned any Flea Market Fancy. I just love the fabric. Sometimes the wonderfulness of the internet and the people using it are just amazing. I can really bring out such kindness and community. Thanks for the giveaway! Gorgeous fabrics and how sweet of her! Wow! Thanks so much for a chance to win little FMF for my sewing pleasure! Very generous indeed! The fabric from Diana is so beautiful! WOW!! Stunning fabric!! Thanks for the chance to win it!! Just think of the quilt you could make with happy, bright fabric!! Aww! That is so neat! Don't you love unexpected surprises? Diana sounds like an angel. her statements are very humbling to hear. how wonderful that she wants to share her fabric with you, it is very inspiring. Now how great is THAT? If I win, I'll pay it forward too! How sweet of her and how sweet of you! Thanks for the chance! Oooooh lala! Pretty fabrics. Thanks for the giveaway chance! love the fabric you received and love the fabric you are giving away! Aren't gifts out of the blue just the nicest thing? It is so nice of you to "pay it forward" too. I love the fabrics you've chosen so I'd love to be in the draw. Oh flea market fancy is so lovely. Thanks for sharing with us all. Peggy took the words right out of my mouth! I was just going to say how I love the "pay it forward" mentality! How kind! Thanks for the chance! So nice to be recipient of random acts of kindness !! I do love that grey & orange FMF . such a lovely giveaway... i AM IN! How special of you to receive fabric from Romania. Isn't the internet wonderful for such things. In the past it would have never happened. I look forward to seeing what you make with them. i love surprises like that AND friends like that. What a sweet lady! A "pay it forward" fabric pass. How fun! I've been dreaming about grays and oranges. Thanks for the chance. I can't wait to see what you do with that lovely fabric from Romania. All of your quilts are so wonderful. Flea Market Fancy - yes please! What a lot of gorgrousness for a Sunday! Thanks for the giveaway. gorgeous fabrics from romania, and thanks for the giveaway for all of us!! The fabrics she sent you are beautiful! Thanks for the giveaway. Could I be so lucky? Wonderful fabrics. You are a very lucky lady to receive those beautiful fabrics! And now someone else will be a lucky lady too. Thanks for the fun give-away. What a sweet thing for both of you to do. What lovely fabrics! And how amazing is the crafty blogging world! What a nice thing to do. Thanks for the giveaway too! how thoughtful of her to send those gorgeous fabrics to you. Your blog is the first place I go to in the morning. I love to see what you've created! 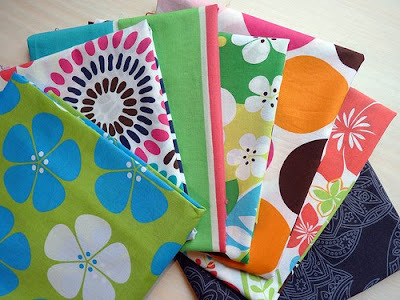 The fabrics you got are so bright and cheerful! Thanks for the chance at such lovely fabric! Thank you for the chance to win some Flea Market Fancy! I came to my fabric addiction after they flew off the shelves. What a lovely gesture she made and you did, too, paying it forward like this! You know the saying, what you give, you get back ten fold....happydays for you both! Those are lovely gifts, both of you! Thank you for this chance. Life is good! Give as good as you get is a family motto - as we have been very blessed in our lives and wish to pass it on to others - each set of fabric is beautiful - I can not wait to see what Romanian beauty you create from Diana's fabrics. that must have been a fabulous package to come home too, the fabrics from romania are beautiful, can't wait to see what you'll create with them! thanks for the FMF giveaway! How sweet! You are very lucky to get such beautiful fabrics! I would consider myself lucky to win the fabrics you are offering, too! Wasn't that nice of her? And so it is, of you. Beautiful fabrics!!!! Cant wait to see what you do with your lovely gift. That is so great! Thanks for the giveaway. I have never owned any Flea market fancy. This is great and what a great thing Diana did for you! I totally believe in paying it forward. Thanks. Love the grey and orange!